Copper salts have traditionally been added to wines to remove unpleasant volatile sulfur aromas. However, investigations of interactions between metals and volatile sulfur compounds are now revealing that metals can also promote the formation and release of these unwanted aroma compounds, particularly in low-oxygen storage environments. Winemakers can minimize the risk of reductive aromas by managing when to make any copper additions and taking steps to minimize metal concentrations. • Reductive aromas in wine are caused by volatile sulfur compounds including hydrogen sulfide (H2S), methanethiol (MeSH) and dimethyl sulfide (DMS). • H2S is described as having a rotten egg odor, MeSH as rubber or natural gas and DMS in high concentration as canned corn or vegetal aroma. • Metal ions have been shown to affect the formation and release of these unpleasant aroma compounds in wine. • Some reactions of metal ions with volatile sulfur compounds are reversible –with metal ions initially decreasing their concentration but later resulting in high concentration. • To reduce the risk of reductive aromas, grapegrowers and winemakers should aim to minimize the metal concentrations in grapes and wine. • Copper additions are most effective if made near the end of fermentation, when yeast cells are still available to remove residual copper ions. Winemakers are very familiar with adding copper sulfate to wines that show rotten egg or other reductive characters when in tank. Many have also seen these reductive characters disappear from their wines in the short term, only to have them return at a later date, sometimes after bottling. By exploring the chemistry of volatile sulfur compound formation and the important role played by metals, these common winemaking observations can be better understood, potentially leading to recommendations of ways to reduce the risk of unwanted reductive aromas. Where do reductive aroma compounds come from? Volatile sulfur compounds responsible for reductive aromas in wine are mainly derived from yeast metabolism. They can also form via the degradation of sulfur-containing amino acids and sulfur-containing pesticides. Metal ions are naturally present in grapes and wine and, in trace amounts, metals are important in fermentation. They can also be introduced into wine by human activity, both through direct addition and as a byproduct of other winery processes. Metals such as tungsten (W), zinc (Zn), copper (Cu), cobalt (Co), iron (Fe), nickel (Ni) and manganese (Mn) all have the ability to catalyze oxidation and reduction reactions, but of these only Fe, Zn, Cu and Mn are likely to be present in wine at concentrations high enough to have a significant effect.1 Aluminium (Al) has also been shown to be important in limiting oxygen consumption in wine.7 Several of these metals have been associated with undesirable effects in wine. Figure 1: Line graphs show three of the metal additions that were associated with the largest increase in H2S concentration at month 12 for Chardonnay samples, and three of the metal additions associated with the largest increase in MeSH concentration at month 12 for Shiraz samples. The metals were present at two levels: a low level equivalent to the concentration of the metals already present in the base wine, and a high level that was spiked to approximately 10 times the concentration of the metals measured in the base wine. The concentrations of volatile sulfur compounds in the wines were analysed over a 12-month period. At bottling, the wines contained oxygen at around the recommended level of 1 mg/L (Chardonnay 1.11 ± 0.34 mg/L; Shiraz 1.43 ± 0.35 mg/L). After four months of anaerobic storage, the dissolved oxygen (DO) of both Chardonnay and Shiraz samples decreased to 0 µg/L. Significant changes in volatile sulfur compounds were observed during the 12-month period, with the Chardonnay samples showing increases in H2S and DMS, and the Shiraz samples showing increases in H2S and MeSH. Three of the metal treatments (Zn, Mn*Zn*Al and Cu*Fe*Mn*Zn) that were associated with the largest increases in H2S concentrations in the Chardonnay samples at month 10 are shown in Figure 1. Using multivariate statistics we found that the increase in H2S concentration was due to the specific metal combinations: Zn, Al, Zn*Al or Mn*Zn*Al and was not influenced by copper or iron. 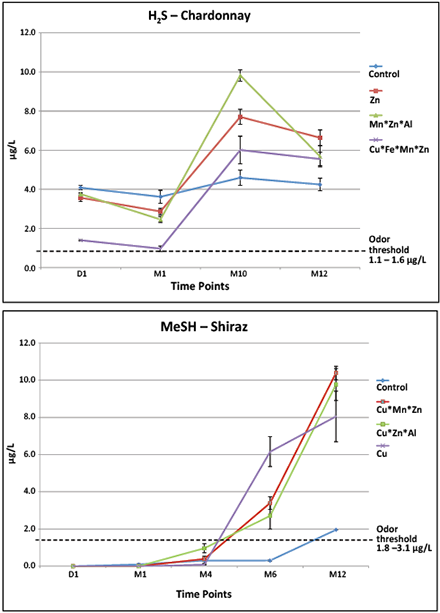 Similarly, three examples of metal treatments associated with some of the largest increases in MeSH concentration in the Shiraz samples are shown in Figure 1. The increased MeSH concentrations in samples with added Cu*Mn*Zn, Cu*Zn*Al and copper were found to be driven by the significant effect of copper and not through the interaction with the other metals. Overall, fewer metals produced significant effects on DMS evolution, and the effect of the metal treatments was mostly associated with an overall decrease in DMS concentration. The only metal treatments associated with significant effects on DMS concentration in both Chardonnay and Shiraz samples were Al and Zn*Al. The effects of these metals in decreasing the DMS concentration could possibly be due to the metals inhibiting the formation of DMS from its precursor molecules already present in the wine, or due to the catalytic degradation of DMS. The influence of the concentration of copper and other metals in wine on H2S production was reinforced in another recent AWRI trial where different levels of copper (0, 0.2, 0.5, 0.75 and 1.5 mg/L) were added to a Chardonnay (both bentonite-fined and unfined) that was bottled under commercial conditions. After six months, the wines with a 0.5 mg/L or greater copper addition had significantly higher H2S concentrations than the lower dose wines. The dosing relationship was especially apparent for the wine that had not been bentonite-fined for protein stability. The difference in results for fined and unfined wines led to further investigation of these wines. which revealed that they had significantly different iron levels (0.2 mg/L for the unfined wine and 0.5 mg/L for the bentonite-fined wine).The extra iron was added through the bentonite-fining process. When the levels of H2S formed after six months were plotted against the copper:iron ratio for each dose rate, a significant linear trend was apparent for copper additions below 1.5 mg/L. This clearly shows the importance of the copper:iron ratio in the formation of H2S. The non-linear results seen at the highest dose rate suggest that once this high level of copper was reached the chemistry followed a different pathway. These effects are not just limited to academic trials. The metal concentrations in 144 wines rejected from a 2011 international wine show because of reduced characters were analysed and compared to the metal concentrations of another 514 wines that were rejected for other faults unlikely to be influenced by metal content. Comparing the concentrations of metals for wines that were shown to have above threshold levels for MeSH (more than 1µg/L) to those that did not, it was apparent that higher levels of iron and magnesium and lower levels of aluminum were associated with the reduced wines compared to the non-reduced wines. This study did not show any impact of copper, probably because the majority of wines tested in this study had a relatively low copper concentration (median less than 0.1 mg/L for both reduced and non-reduced groups). In the large multi-metals study, some metal treatments were initially associated with decreases in volatile sulfur compound concentrations, but these effects were shown to reverse after four months of anaerobic storage. At day 1, when samples were analyzed directly after metal spiking, when DO concentrations were high (0.15–1.50 mg/L), the three metal treatments (copper, iron and Cu*Fe) decreased the H2S concentration compared with the control. After 12 months of anaerobic storage, the samples treated with copper and with Cu*Fe displayed significant increases in H2S concentration. In the Chardonnay and Shiraz samples, the same reversible effect was observed for MeSH as was seen for H2S. At day 1, no MeSH was measurable in Shiraz samples with or without added copper, but after one month of anaerobic storage the samples not treated with copper showed increases in MeSH compared to the samples treated with copper. However, as the wine consumed all available oxygen, the MeSH concentration in the copper-treated wines slowly increased. After 12 months of anaerobic storage the MeSH concentration in all samples with added copper had reached an average of 6.39 µg/L, substantially higher than its odor threshold value of 1.8-3.1 µg/L.3 These results show that the formation of MeSH is not only influenced by the presence of metals, but that the oxygen concentration in wine also significantly affects its evolution. Winemakers should pay attention to this observation of reactions reversing over time, particularly when considering routine additions of copper to remove unwanted sulfur aromas from wine. Copper additions are effective if made early in a wine’s life, preferably around the end of fermentation, when yeast cells are still available to help “mop up” residual metals. If, however, copper is added later, significant amounts can remain in the final wine, greatly increasing the risk of developing reductive aroma compounds in the bottle. This study has demonstrated the importance of keeping metal concentrations as low as possible in wine, as the metals can act singly or in combination to greatly influence evolution of unwelcome reductive aromas. This text was edited from original publication in the January/February 2014 Wine & Viticulture Journal, with permission of the publisher, winetitles. This research was facilitated using infrastructure provided by the Australian government through the National Collaborative Research Infrastructure Strategy (NCRIS). The Australian Wine Research Institute (AWRI) is a member of the Wine Innovation Cluster in Adelaide, South Australia. The work was supported by Australia’s grapegrowers and winemakers through their investment body, the Grape and Wine Research and Development Corporation, with matching funds from the Australian government. Ella Robinson is thanked for her editorial assistance. 1. Lachner, R., and G. Nicolini. 2008 “Elements and inorganic anions in winemaking: Analysis and application.” In Hyphenated Techniques in Grape and Wine Chemistry; R. Flamini, Ed. ; John Wiley & Sons Ltd: Chichester. 290. 2. Lopes, M., M.A. Silvia, A. Pons, T. Tominaga, V. Lavigne, C. Saucier, P. Darriet, P.-L. Teissedre, and D. Dubourdieu. 2009 “Impact of oxygen dissolved at bottling and transmitted through closures on the composition and sensory properties of a Sauvignon Blanc wine during bottle storage.” J. Ag. Food Chem. 57: 10261–10270. 3. Siebert, T.E., M.R. Solomon, A.P. Pollnitz, and D.W. Jeffery. 2010 ”Selective determination of volatile sulfur compounds in wine by gas chromatography with sulfur chemiluminescence detection.” J. Ag. Food Chem. 58: 9454–9462. 4. Ugliano, M. 2013 “Oxygen contribution to wine aroma evolution during bottle aging.” J. Ag. Food Chem. 61: 6125–6136. 5. Ugliano, M., J.-B. Diéval, T.E. Siebert, M. Kwiatkowski, O. Aagaard, S. Vidal, and E.J. Waters. 2012 “Oxygen consumption and development of volatile sulfur compounds during bottle aging of two Shiraz wines. Influence of pre- and post-bottling controlled oxygen exposure.” J. Ag. Food Chem. 60: 8561–8570. 6. Ugliano, M., M. Kwiatkowski, S. Vidal, D. Capone, T.E. Siebert, J.-B. Dieval, O. Aagaard, and E.J. Waters. 2011 “Evolution of 3-mercaptohexanol, hydrogen sulfide, and methyl mercaptan during bottle storage of Sauvignon Blanc wines. Effect of glutathione, copper, oxygen exposure, and closure-derived oxygen.” J. Ag. Food Chem. 59: 2564–2572. 7. Vivas, N. 2002 Les Oxydations et Les Réductions Dans Les Mouts et Les Vins. Edited by Feret Eds Ed. ; Bordeaux. 8. Viviers, M., M. Smith, E. Wilkes, and P.A. Smith. 2013 “Effects of Five Metals on the Evolution of Hydrogen Sulfide, Methanethiol and Dimethyl sulfide during Anaerobic Storage of Chardonnay and Shiraz wines.” J. Ag. Food Chem., dx.doi.org/10.1021/jf403422x.